He made his debut for New South Wales as an eighteen year old in the 1999–2000 Australian domestic season. Clarke quickly began showing his potential, after being fast-tracked into the Australian national team, making his One Day International debut in January 2003 against England at Adelaide. He immediately made a name for himself on the international scene for his aggressive yet mature batting ability. Clarke was chosen to make his Test debut against India at Bangalore, October 2004, despite having a first-class average below 40. He succeeded on debut, scoring 151 and consequently helping Australia to victory, invoking comparisons to past Australian batsmen such as Doug Walters and Mark Waugh. The innings, felt Peter Roebuck, was especially notable for its aggression and freedom. "Not that the assault was reckless," he added. "Indeed the control was impressive. Clarke calculated the risks and took his brains with him down the track. Of course he need [sic] a bit of luck, was plumb in front in the nineties, but few begrudged him his hundred. And everyone except his weary foes celebrated with him and his tearful family when he reached three figures. After all, he had advanced both the match and the game." Clarke went on to play a major part in Australia's 2–1 series victory, their first in India in over thirty years, contributing figures of 6 for 9 off 6.2 overs in the Fourth Test, which Australia lost. On his return to Australia he made another debut century, his first home Test in Brisbane against New Zealand, becoming one of the few Test cricketers to have achieved the feat of Test centuries on both their home and away debuts. In recognition of his performance in the 2004 calendar year, he was awarded the Allan Border Medal in 2005. Clarke's poor form during the 2005 Ashes series and his failure to score a test century for over a year saw him dropped from the Test team in late 2005. Clarke had previously remarked that one of his career aims was to never be dropped from the Test team. In early 2006, after making his first first-class double century and scoring heavily in ODIs, Clarke was recalled for the tour of South Africa. He was then picked over Andrew Symonds for the April 2006 Tests against Bangladesh. Two consecutive centuries in the second and third Ashes Tests while Shane Watson was injured helped Australia to regain the Ashes and cemented Clarke's position in the Test team. Clarke then helped Australia retain the World Cup in 2007 in the West Indies where they did not lose a game. After Damien Martyn's retirement he was elevated to number 5 in the batting line up. He had a superb tournament making 4 fifties including a 92 and a 93* against the Netherlands and South Africa. He also made an unbeaten 60 against South Africa in the semi final to guide Australia into the final at Barbados, against Sri Lanka. Clarke faced only 4 balls for 3 runs in the ICC World Twenty20, when Australia were knocked out by India in the semi final. Two weeks later he made 130 against India in the first of a 7 match ODI series. He did not maintain that form in the remaining 6 matches mustering up just one fifty. He opened the batting in the final 2 games after a hip injury ruled out Matthew Hayden and he made two golden ducks. In the tour-ending Twenty20 match Clarke dropped back down the order with the return of Hayden, and scored 25 not out in a heavy defeat to the current Twenty20 world champions. On 6 January 2008, Clarke dismissed Harbhajan Singh, RP Singh and Ishant Sharma in the second last over of the day, with just 8 minutes remaining, to claim the final three wickets and win the test match for Australia (at one stage he was on a hat trick, dismissing Harbhajan Singh and RP Singh on consecutive deliveries). His innings figures were 3 for 5 in 1.5 overs. Australian captain Ricky Ponting had declared that morning, setting India a total of 333 to chase and allowing Australia arguably too little time to bowl out the visitors. Clarke's wickets ensured that Australia retained the Border-Gavaskar Trophy in 2008 and kept their world record equalling 16 match win streak alive. Since the retirement of Adam Gilchrist, Clarke has taken over the mantle as Ponting's vice-captain, but Clarke missed the start of Australia's 2008 tour of the West Indies following the death of Bingle's father, meaning Hussey took over as vice-captain for the start of the tour. Soon after Clarke joined up with the squad, he scored a century in the second Test in Antigua, going on to captain the side in the final two One Day Internationals, both of which were won, in the absence through injury of Ponting. He was named man of the series in the recent two-Test series against New Zealand in Australia with scores of 110, 98 and 10, as well as being the top run-scorer in the three-Test series against South Africa in Australia. Clarke won the 2009 Allan Border Medal in a tie with Ricky Ponting both scoring 41 points, and was named Test Cricketer of the Year. 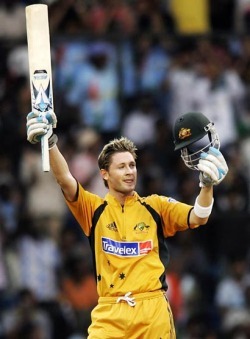 In October 2009, Clarke was named as captain of Australia's Twenty20 side, taking over from the retired Ricky Ponting. His deputy is Cameron White. During the Australian Cricket tour of New Zealand (March 2010), Clarke left the tour to return to Sydney for "personal reasons" after Bingle decided to sue her former lover Brendan Fevola for disseminating naked pictures of her, which ended up in a women's magazine. A couple of days later, it was reported that Clarke had ended his relationship and cancelled his wedding to Lara Bingle. Clarke's Management confirmed the couple had decided to terminate their engagement in a late night press conference on Friday, 12th March 2010.